Molecular biomarkers are one of the most promising innovations in modern biology with applications ranging from pharmacology and basic biological research to clinical indicators of safety and efficacy. Having an indication of a significant biological change at the molecular level can provide information about toxicity, efficacy, and overall pathway function long before systemic effects can be observed by traditional means. LC-MS/MS is renowned for its ability to uniquely detect small molecules with acid/base functional groups in biological matrices. The primary advantage of LC-MS over other techniques is the ability to multiplex the analysis. Mixtures of compounds are as easily quantified as individual compounds. A rational approach to biomarker identification and validation dramatically increases the probability of success over shotgun approaches. We rapidly develop specific LC-MS/MS methods for target proteins using leading edge hardware and software in combination with novel analytical processes. Multiplexed assays for allow quick evaluation of potential protein biomarker collections. 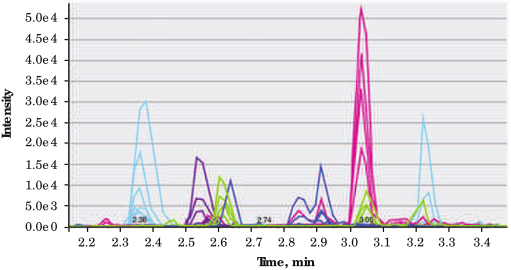 Multiplexed protein assays based on LC-MS/MS can uniquely follow 50 or more proteins in a single sample. Rather than focusing on a single protein biomarker, an assay might follow many of the proteins thought to be important in a biochemical pathway, thus providing a read-out on both the individual proteins and the pathway as a whole.